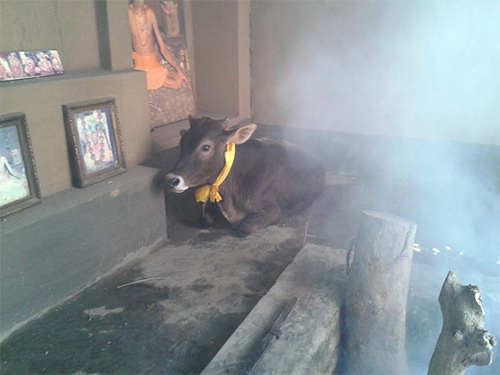 A mahatma named Chaitanya Baba who lived in the forests of Odisha entered maha samadhi recently just after Makara Sankranti. This short video shows the placing of his body in the ground and burial. 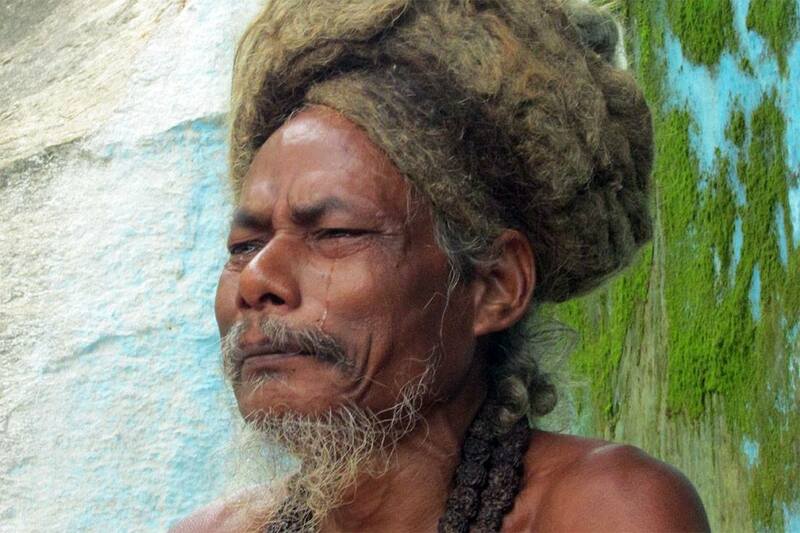 For many years he had been staying in the forests of Ratna Giri mountain. 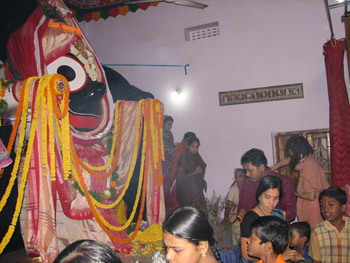 Every year he holds a three day festival there on Makara Sankranti where thousands of villagers come. This year he attended for the three days as normal, and on the 4th morning at 3am he left his body. Any time he would hear people singing Bhagavan’s name tears would come to his eyes. I have personally seen it many times. He was a very unique sadhu. One of the first times I went to see him, I asked him why he chose this place to have his ashram. He called me aside and said I will show you a secret and then you will know. He took me a bit into the forest at the base of the mountain where there was a perfectly formed natural staircase running up to the top of the mountain, looking as though carved in black stone. I asked him what it was, and he smiled and said no one knows what it is, but it has been here from time immemorial. Then he showed a footprint melted into the side of the mountain at the start of the staircase, and said this is Devi’s footprint, and this is the Deva’s staircase. (I will try to do another article on this topic later.) He clearly knew many secrets about this holy place, but kept most inside. Several times he showed me special caves, which he said were gateways to other dimensions. 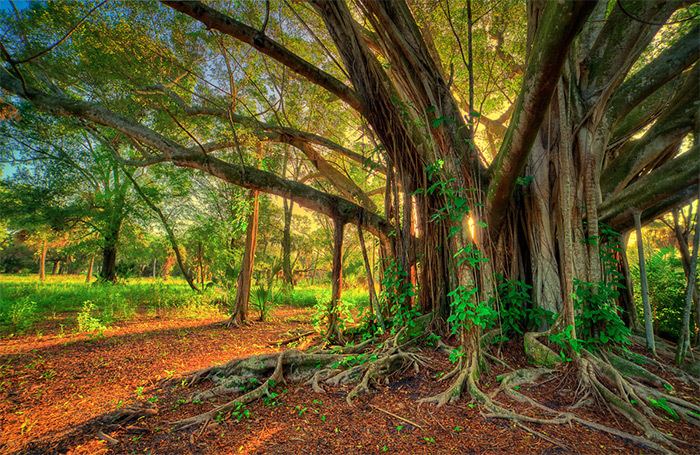 And once he showed me the root of a banyan tree coming into a cave from the ceiling and told me this root was the most important place here and was where Ma comes and reveals her self. 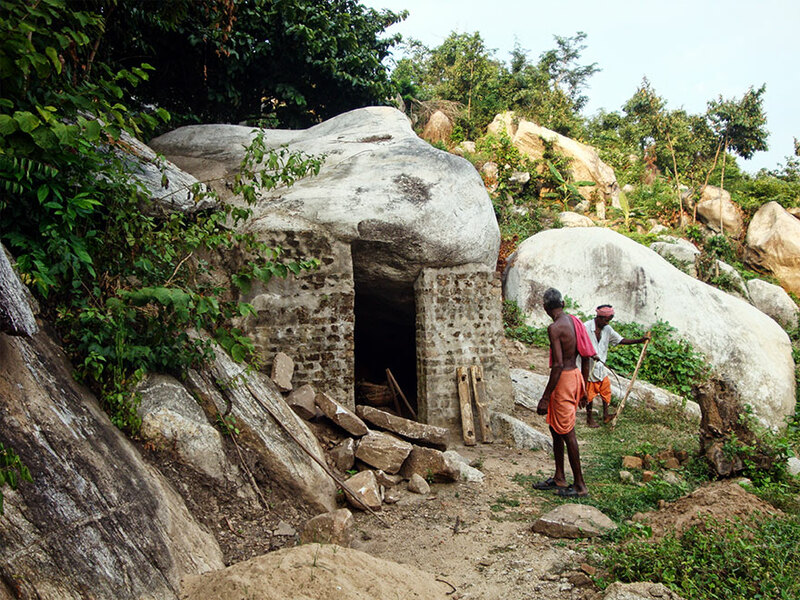 He created several small cave rooms for sadhus to stay, himself doing the mason work. He would get some cement and bricks donated by local devotees, and do all the masonry work himself. One of the cave rooms made by Chaitanya Baba. I had the good fortune to be around him for the last 10 years, but he never asked me for anything. 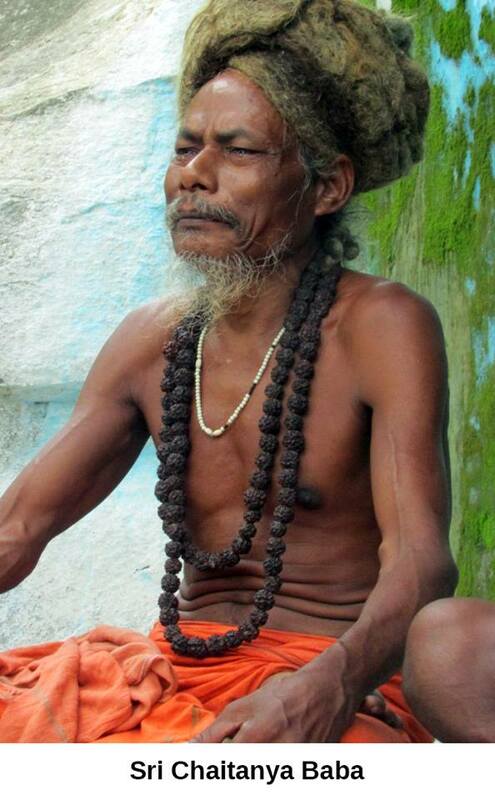 I would often find him wandering the hillside or visiting one of the other babas who have ashrams on the hill. I request the readers to take advantage of the the presence of these saints and sadhus and try to meet them before they leave us. 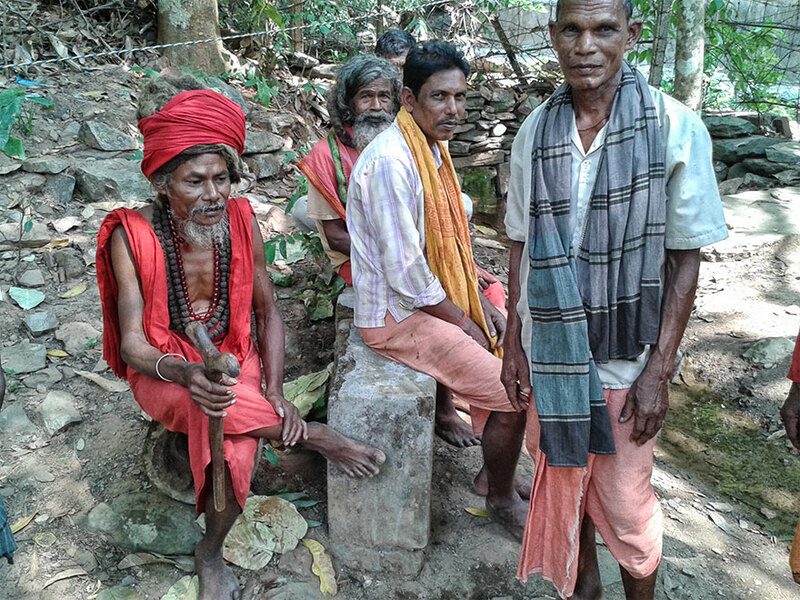 In the last 10 years I have seen more than a dozen saints and siddhas enter samadhi in various places in Odisha and Tamil Nadu, without most being known to the public. When they leave us, humanity loses an ocean of spiritual knowledge earned from their decades of sadhana and penance. Try to meet them and get even one drop of the amrita they have captured. Saints still exist in this world, but you have to search for them. They will not be famous or advertising themselves on the TV. 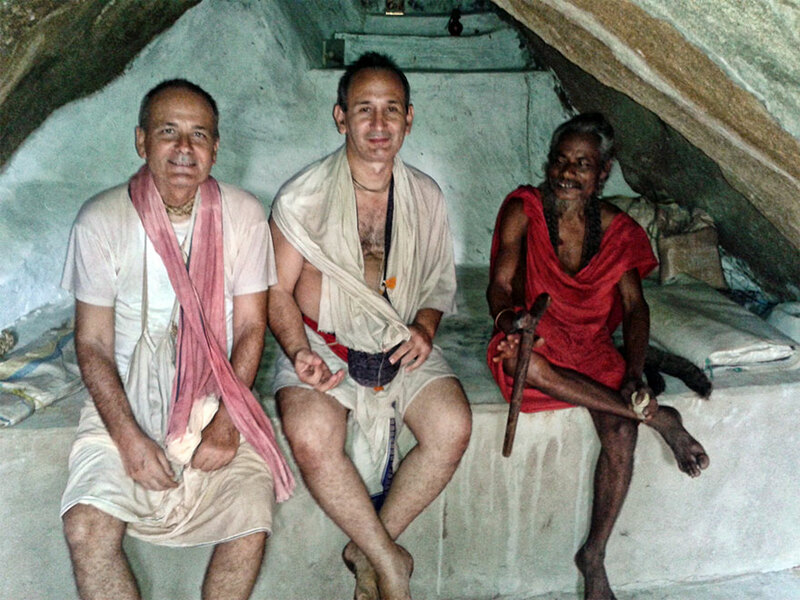 They will be staying alone in remote places like the forest, focusing on their sadhana to God. Once a visitor asked Chaitanya Baba if he could tell his future. He replied, “Wait a few years and every person in the street will be able to tell your future.” The implication was that in the future there would only be sadhus left in the world and who ever remained would be of a special quality with special abilities. On the 28th of January there will be annadanam held in his village, to mark the 11th day after his passing, as is their custom. Later this year we will try to construct a small memorial above his samadhi site. There always vibrates the living presence of realized souls in the immortal land of India making the land ever sacred. Even if sins and crimes are on the rise in modern days still there lurks the invisible rays of spirituality emanated from immortal souls of the highest spiritual realization; India, the nation of eternal Vedic Culture and Heritage will always transmit rays of Truth and Universal harmony even from behind this apparent veil of darkness and inconscience. Long live Babaji who took Mahasamadhi on Makar Sankranti and let Him inspire all of us to reach the summit in the evolutionary process of the soul in quest of the Supreme, the only goal of mundane life. Hari Om..! Pranams…! I was awestruck after having seen the Tiger Baba’s Burial…very simple down to earth siddha..! Long live great soul of Baba. Please keep on inspireine and give solace to mortal being. dear sir, you r 100% true about the presence of sevral genuine siddhas and sadhus thru-out present India also..It’s only due to such people that mankind hasstill survived despite such horrible sins and weaponary to destroy itself many many times…not only that due to their tapasic vibrations the mankind will be ascending to level perdicted by BABA, when most of us will have supernatural powers like future perdictions etc….tathaastu !!! BABA is great. He will Bless who sees his face through videio may get / full fill their desire and Blessing . Please share details where this is and how to get there. You enter the world from mothers womb and you will disappear in to the womb of this mother earth. So simple. This video is an eye opener. The same night Makara sankrathi, 14th Jan i had my Car hit a big Stone in the middle of the road (Kanpur to Sagar NH) while travelling from Varanasi to Pune damaging the oil chamber of the Engine. With the grace of Krishna, we were safe and road side assistance arrived to take us to 250 km away to Jodhpur. Makara star transition would have some effect on all of us, i suppose. Amazing ! does anybody know how to get this area of baba,s samadhi ? Thank you all so much for sharing this news – and thank you Baba , despite not knowing you – your photo of tears whilst hearing kirtan/HolyNames, inspires me too. Thank you to BV Ashram for bringing such news to us as well. Please keep up this excellent work. great soul how simple these people are.see his love for maa. Wonderful article, thank you for sharing. How precious you are Sri Chaitanya Baba! Thanks to the good people who posted this, I am much blessed by your darshan. I am feeling myself unfotunate for not visiting this Sadhu when he was in his mortal body. Wonderful to hear of the mystical life of this Baba, I had never heard of him before this, so it feels a blessing to come across this article. If anything to honor the simple example of devotion he has lived with no fame of it during his life and now he is in great bliss many people on the path of truth can be encouraged by this modern sage. “Wait a few years and every person in the street will be able to tell your future.” – I felt what Baba was trying to say was, in a few years the future would crystallize and then everyone would know of it.. what I felt was that He was trying to say that we shouldn’t think of what the future holds for us (even though doing that seems next to impossible for most of us). Our thoughts about our futures guide us almost all of the time, may we be blessed and guided so that we think of only God in our present and future, so that our current actions are guided by God alone. Astonishing Videos. May the Almighty bless us all and we prey for the entire country to be peaceful in all aspects. Namaste, Is it possible to get the address of this location? 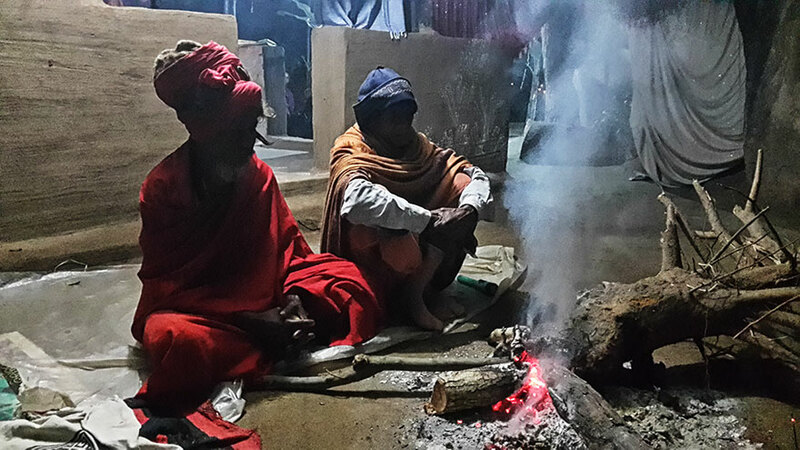 I would like to visit and pay honors to such sadhus. I am bless to see Baba and the video. Thanks Divine Order. THANK YOU SIR – PLEASE LET US KNOW HOW TO REACH THESE ASHRAMS. The Real Spiritual Wealth of Our Country Lies Hidden in Such Great sadhus and tTheir Spirituality is the Manifestation of the The Great Hidden Force or The Hand of God That Has Steered The Destiny of Our Great Country Through All The Turbulence Through Centuries of Invasions our Country-Without Diminishing The Spirituality That is Ever Present in Our Country and Will Continue to Steer The Destination of our Country in Future too. Salutations o the Great Souls Who Come, Live and Depart Doing Their Silent Sadhana For The Benefit Of All Mankind. I am very fortunate to witness the simple burial of Saint Baba. 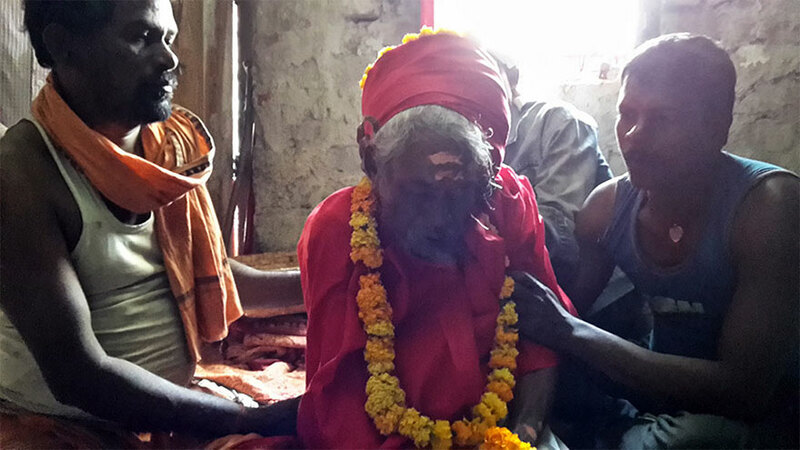 The villagers and devotees were indeed very kind to attend to the final rites. I hope to receive Saint Baba’s blessing. It was per chance that I could witness such sacred ceremony. Thanks to the kind person. I don’t understand his being buried as opposed to cremation. Please let us know how to reach that place. I am touched.Wish to be there at least once . Kelvin Would you please mention the detail address of the place. Or anybody else who could provide ua with the place nmae,District and Block detail of this location so thta others could visit .I am keen to visit. India great country too have great people to give birth. The blessings of Sadhus to get piece in the nation. Since many people are asking how to get here, I will write one article with detailed instructions. Mentioning the address will really ensure many helping hands extended towards the sadhus and even it will help people get associated with the holy souls and in their spiritual journey. THIS IS SOME THING UNIQUE,….. It was interesting remarks that i read from the article of the writer Shri Jhahnva.N.Das Chaitanya babaji when a devotee asked him to tell about the devotee’s future replied that the devotee should wait and would see at every corner persons to tell his future. As i conclude what the writer implied was that only sadhus saints would survive in this world heading for catastrophy and doomsday or is it that the path of divinity shown by the such exalted spiritually oriented sadhus would shine into the world for the survival of the human race.Let the writer please clarify it. THANKS FOR VIDEO AND ARTICAL. Having read the article is already such an amazing feel. Let alone for those who attended the sacred ceremony. Thanks for sharing the experience . May God bless all human kind. Thanksto. 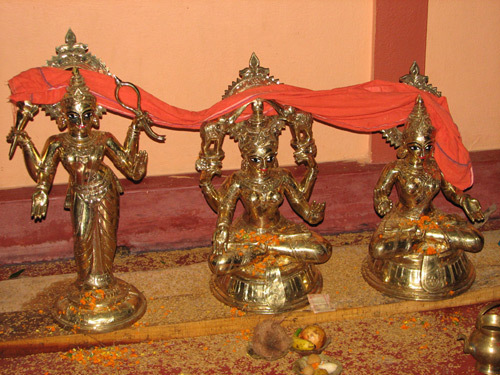 Bvashram.org. for this. Useful. Newsabt. Baba. Some. More inf culdhave. Been. Got vfrom this. Baba.his. blessing. Will always be there.some. 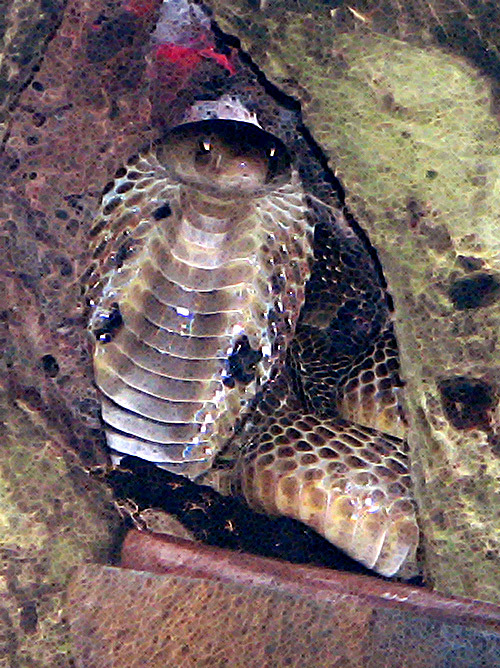 smarak. Has to be. Built in his. Memory andthis news has to spreadfar and wide.this will. Increase spirituality in people. Assaid earlier people. Who. Know. Such. 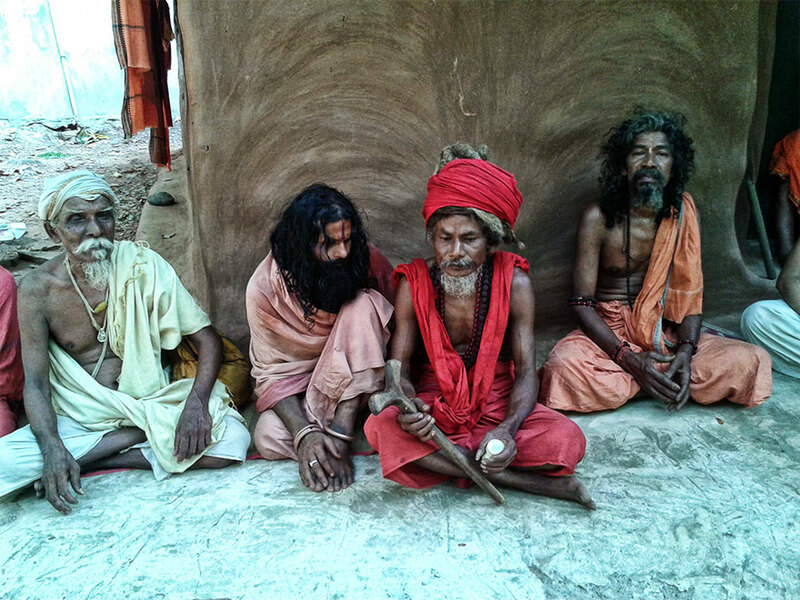 Sadhus. Should. Get. More. Details abt their past. Vast. Knowledge. Recordtake. Photos and. Make. Publicin tv newspapers. Travel. Agents etc. Apart. From. Publishing only. Bollywood etc. No doubt we , those living in the near by area could not visit the great soul before his mortal departure are certainly unfortunate. We missed a rare opportunity of Satsanga with Sri Chaitanya Baba which would have proved immensely beneficial and indispensable for our progress in spiritual path. Amazing! Wonderful article! Very fortunate to me seeing the burial. Thank´s. Where is this place? How can I contact somebody that lived there? Namaste. I’m very surprised to see that Baba is buried; I know that Muslims are usually buried and in a sitting position. I’m really puzzled and would like to know the reason of Baba’s burial especially in this way instead of him being cremated; thank you and God bless. Salutations to Chatanya Baba. We lost one of the Paramhansa. Where is this place located ? Whats the best possible way to reach Babajis Ashram ? Astonishing . immortal souls .. Very Unfortunate , Such Sadhus are Rarely accessible to Common Persons ..
it is really excellent. I am interested to visit the ashram. Can you guide me the route map to visit.